In 1854, cholera struck London. Again. The disease was a frequent visitor to the capital, and it swept through the city, decimating neighbourhoods. No-one knew what caused it, though the ‘great stink’ of the sewage flowing freely down the streets and along the Thames was the prime suspect. Most people thought the very smell of the air – the miasma as they called it – was causing the disease. One man disagreed. His name was Dr John Snow, and he had a theory that cholera was caused not by contaminated air, but by contaminated water. For several years, Snow had been trying to convince the authorities of this, but to no avail. 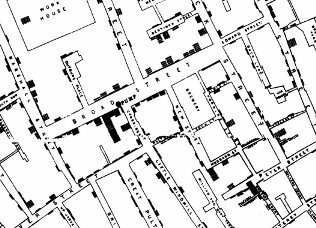 In the 1854 outbreak, though, he took a new approach: he and a friend carried out a survey of the homes affected by the disease. At first, he planned simply to present a table of results to the relevant authorities, but then he had another idea – why not create a map? That way he could illustrate his point with crystal clarity. So he did. For every death a home had suffered, a small black bar was drawn. The longest line of black bars you can see in the map section above shows 15 deaths in the household. As Snow had expected, the key factor linking all the homes with deaths was that they all took their household water from the Broad Street pump. With such clear, visual evidence, Snow was able to get permission to remove the handle from the Broad Street pump, effectively stopping the disease in its tracks. The next phase took considerably longer, but with his map, he was eventually able to convince the authorities of the need to create proper sewage and drainage systems, and to clean up the river, from which the population was drawing its drinking water. Last week I wrote about high art and a row of old coats being used to create new cultures. This week it’s maps. What will stumble across my path next week? Who knows – maybe you’ve got some ideas. If so, feel free to share them!